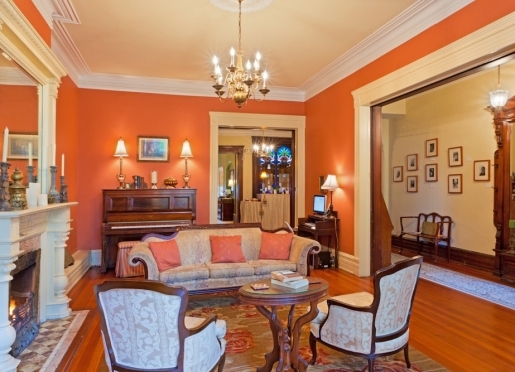 Relax and enjoy the first floor parlor. 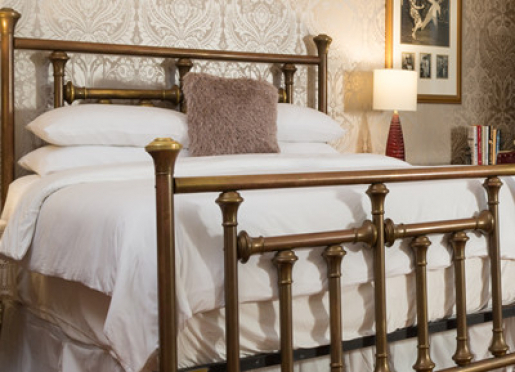 Be inspired with this 4th floor suite. 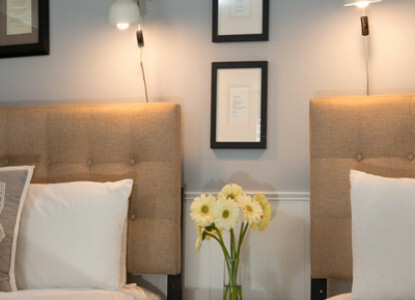 Tucked in the eves of the home, yet bright with a large skylight, neutral tone and 2 windows, this room proves to be very popular with our guests looking for a little romance or pampering. 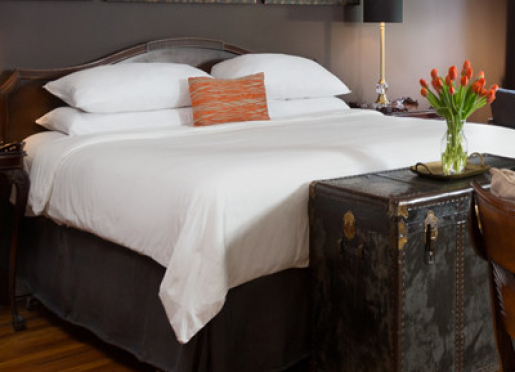 The room is furnished with a king sized iron bed and sitting alcove with 2 reading chairs. The ensuite bath is shower only, however an antique claw-foot soaking tub is tucked in the room, and perfect for a hot bubble bath. WiFi is available throughout the home. A hot cooked breakfast is served each morning at 8:00 a.m. weekdays and 9:00 a.m. weekends and holidays. 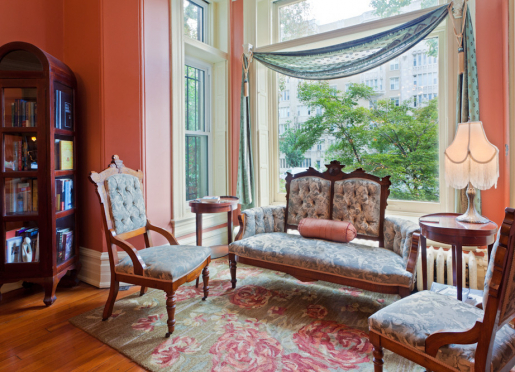 Poet and Playwright Langston Hughes is memorialized in this 3rd floor guestroom. 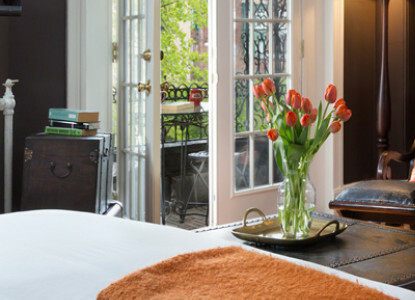 Decorated in deep browns and greens, this room includes a small private balcony overlooking 16th street. The second of the largest rooms in the house, guests will find a king sized bed, decorative fireplace sitting area and ensuite private bath with 2 person Jacuzzi tub and shower. A queen-sized 4-poster canopy bed sets the tone of this second floor guestroom decorated honoring the romantic in all of us. Situated at the rear of the home, allowing for a quite peaceful nights sleep, or quiet respite from life's hectic pace. The private ensuite bath features an oversize glass and tile shower. Located on the 3rd floor, this guest room offers a queen size bed with upholstered headboard, and private shower only bath. Sleek trim decor, hardwood floors and decorative fireplace give this room a modern feel mixed with old world charm. Nobel prize winner, 1993 for her collected works and Pulitzer Prize, 1988 for Beloved, Morrison is best noted for her “epic themes, vivid dialogue and richly detailed African American characters.” Located on the second floor, in the middle of the house, this room features a queen-sized bed, decorative fireplace, and private, shower only bath. 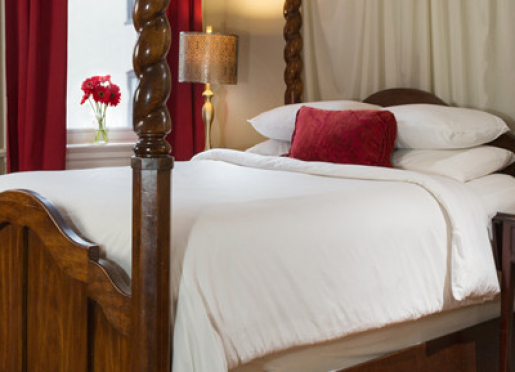 Best known for his Mystery novels featuring lead character Easy Rawlings, guests who stay in this suite often feel as though they are staying in Mr. Mosley's secret writing retreat. The Mosley Suite is located on the 3rd floor and rear of the home. 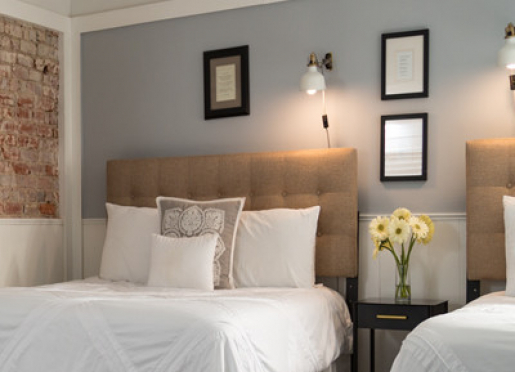 The room offers a queen sized bed and twin daybed, decorative fireplace, writing desk and private bath with couple's shower with dual showerheads. Decorated in tribute to Zora Neale Hurston, this second floor guestroom faces picturesque 16th street and is decorated in bold red hues. One of the largest rooms in the house, it is furnished with a Brass King sized bed, antique writing secretary, and mirrored armoire. The front bay window allows plenty of natural light. The private bath features a 2-person Jacuzzi tub and shower. 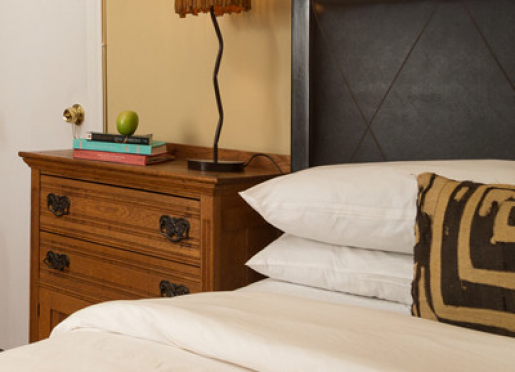 Located on the 4th floor of the home, the Poetry Room features two Queen size beds accommodating up to 4 guests, a comfortable sitting area with a sofa/chaise lounge, cable TV and a small refrigerator. 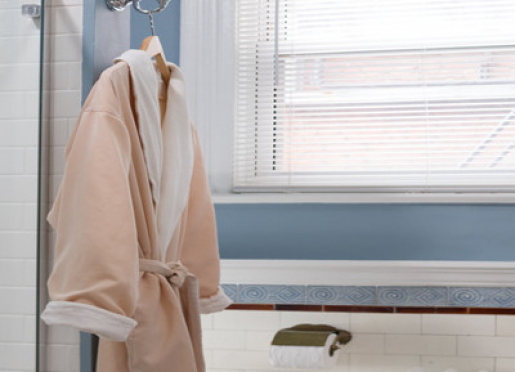 The private bath offers an oversize tile shower. Rates vary by season, and may also be changed or adjusted based on events here in Washington. 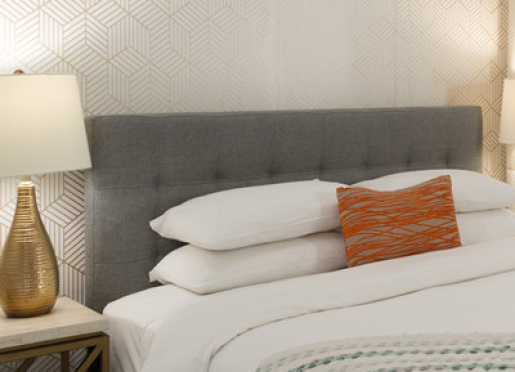 Rates also vary by room selection, since each room is individually decorated. The rate information below is somewhat general; please click the “check availability” link for specific room availability and rates. 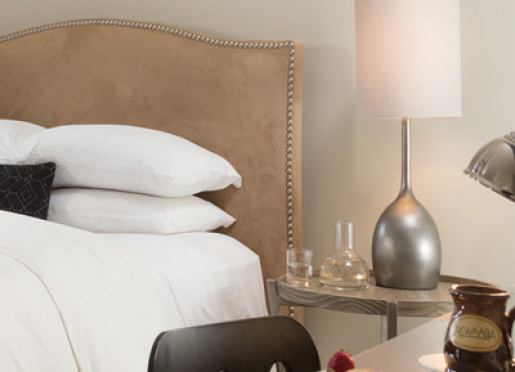 Reservations made 2 weeks or more before arrival require a non-refundable $50 deposit for each guest room. Reservations made less than 2 weeks before arrival require payment in full at the time of reservation. Cancellations are accepted up to 2 weeks before arrival. The original deposit becomes the cancellation fee. Should you need to cancel less than 2 weeks before your arrival, once final payment has been made, we can only offer a refund for nights we are able to resell. We strongly recommend purchasing trip insurance to cover unexpected circumstances that would prevent you from traveling last minute. We are a smoke and pet free facility. Smoking is only permitted outside in the front garden. We do not have any pets on site, and regretfully are not able to accommodate guest pets. We offer 2 off-street, reserved parking spaces directly behind the B & B, available for $20 per night, plus the DC parking taxes. If these parking spaces are already reserved, we can direct guests to a nearby public parking garage, fee's about $20-35 per day. Parking on street is very restricted, requiring a resident permit. Resident only restrictions are lifted starting Friday evening at 7:00 p.m. until Monday morning at 7:00 a.m.. While on-street parking is possible on weekends, it can be difficult to find a spot in our neighborhood. Normal arrival at Akwaaba DC is from 2:00 p.m. - 7:00 p.m. for our personalized welcome and greeting. We can usually accommodate arrivals for luggage drop off as early as 10:00 a.m. and late arrivals as late as 11:00 p.m., please be sure to indicate your expected arrival time when making a reservation. Check out time of your room and parking space is by 11:00 a.m.. We can usually arrange to hold your luggage until 7:00 p.m. should you wish to spend your last day in the city before heading home. 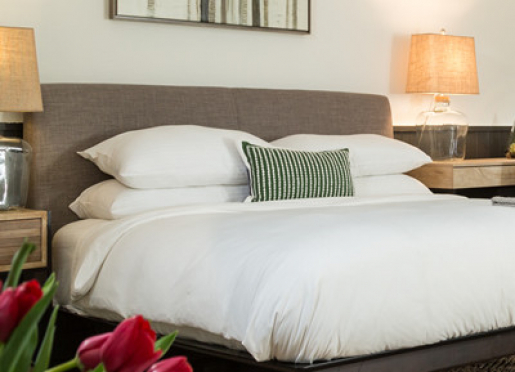 Advanced reservations for any of the guest rooms require a 2 night stay. We will accept 1 night reservations whenever possible, please call us directly, toll free 877-893-3233. 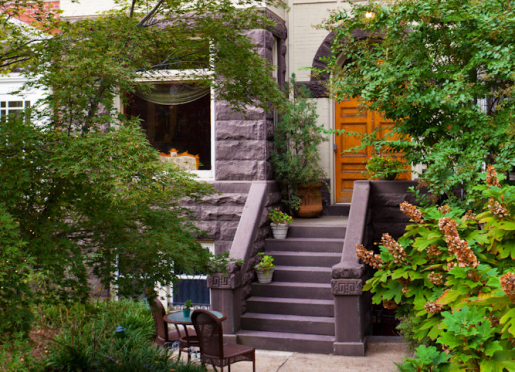 Bed and Breakfast Accommodations of Washington, DC, handles all reservations for the Washington, DC, location of Akwaaba Bed and Breakfast You will find their contact information below. We have used their service now for more than 15 years, they are an integral part of our operations in Washington, DC. Please direct all inquiries for Washington, DC, to Alan, Katch, Tracy or Steve, they will be happy to assist you in securing reservations. 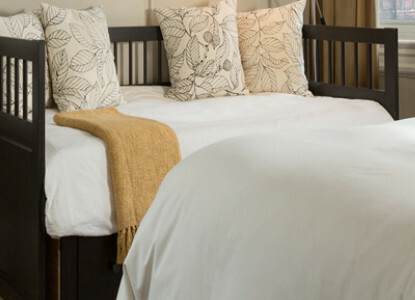 If you are interested in traveling to any of Akwaaba Bed and Breakfast's other locations Brooklyn, NY, Cape May, NJ or Bethany PA, please visit the web site www.akwaaba.com. Thank you for making an inquiry about staying at Akwaaba Bed & Breakfast.